1. The power of the Internet. 2. The power of focus. 3. The power of ASKING. I’ve always agreed with Albert Einstein, who felt that genius came not in knowing all the answers, but in knowing where and how to look for those answers. I loved how hobbyist David Patton got a surprise Christmas bonus from Tony Oliva. Tony O appreciated David’s sincerity, and gave him a no-charge autograph with a greeting. When David told me about his one big autograph project, I had a suggestion. He needed Masanori Murakami, the first Japanese player to pitch in the majors. But how? Japanese postage? What language should a letter be in? Are there other customs the retired star would appreciate? I suggested he seek the advice of Japan’s Kohei Nirengi, a talented collector who excels in TTM autographs. Kohei is a bilingual fan with a thorough knowledge of American and Japanese baseball. “I want to thank you for introducing me to Kohei. He is truly a great supporter of the hobby. He was so accommodating to me and offered a few ideas which probably improved my chances of success. I hope to meet him some day. I collected cards as a kid but didn’t do any autographing. After my retirement in 2007, I decided to finish off a raw 65 set from my childhood. That took about a year and then I didn’t know what to do next. I was looking for a challenge which wouldn’t break the bank. Then I found out about www.sportscollectors.net from a post on the CU message boards and soon I was hooked. I decided to sacrifice the 65 set for autographs and sent out my first card on 4/17/09. I was fortunate to select a set with so many great TTM signers. So far I have 489 different autos with 349 of those coming through the mail. That’s71 percent! I’m now down to about 12 or so living players who are all toughies. I know that I’ll never complete the set, but I hope to get as many as reasonably possible and hope to break 500 this summer. My quest for Murakami began at the National two years ago. I was at a booth which sold Japanese cards and asked if they had any information about him. Luckily there was another customer there who had been to Japan and met Murakami. He said that he had a 65 Giants team card signed by Murakami which he would sell to me. After months of searching he was never able to locate the card, but the experience did give me the idea of finding a connection in Japan to help. I sent my letter to Murakami through Kohei and he included an interpreted letter along with mine. 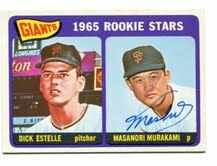 I also included a rookie card for both Kohei and Murakami as well as an SSPC card for Murakami. Coming Friday: Kohei A bonus letter reply? Nirengi tells more of the stunning Murakami success! Back in 2010, I saluted Facebook’s “Baseball Player Passings” page. Dave Lambert shared the story of the site’s unique origin. The site thrives. Before any obituary surfaced ANYWHERE online, one of the 500-plus members posted word that Kevin Hickey had died. Small wonder. I see that 14 administrators collaborate to keep the news flowing. Members seek out gravesites of deceased baseball names. Obituaries are posted. Want to be part of an all-star team? members of BPP include former baseball players, the media — names that would produce double-takes from the most jaded collectors. 1. Baseball history isn’t limited to a few superstars. Recent obituaries posted included Lil (Mrs. Stan) Musial and John Kuenster, former editor of Baseball Digest. I’ve seen obits on many “girl’s leaguers,” the pioneering women of the AAGPBL. As I look to write to other baseball history makers, it helps me to dig deeper. Retired players dying in their 50s? This isn’t a hobby for procrastinators. Check out the Facebook page. Join. Enjoy the memorials. I hope you’ll be posting about how you received a nice letter from a recently-deceased retiree…while there was still time. Coming Wednesday: An elusive autograph and MORE from Masanori Murakami. 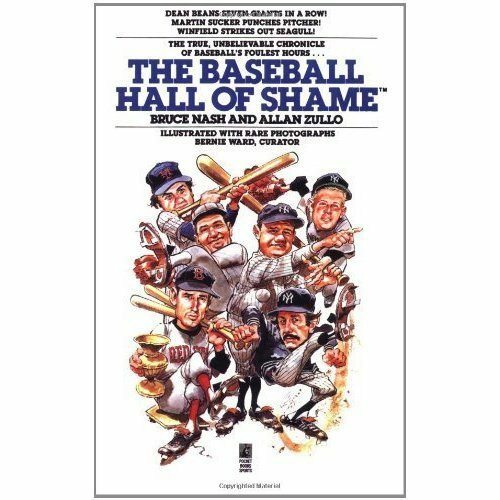 Q: The “Baseball Hall of Shame” series debuted in 1985, gracing four volumes. Now, “The Best of Blooperstown” is a fifth! What’s new here? A: We have taken the best of the previous four books and added about 40 percent new material. Unfortunately, we don’t have any examples of players sending us letters. We interviewed many of them by phone or in person; the older stories were based on old newspaper accounts, chronicles and memoirs that we found at the library of the Baseball Hall of Fame. Q: Speaking of baseball “shame,” what’s your current assessment of autograph signing? A: You’re the expert on autographs, Tom. You already know what we’ve discovered: Too many of today’s players hate signing autographs because they don’t have the time or feel that fans are profiting off of them. If you’re not a grade schooler or a beautiful woman, chances are not very good that you will get an autograph in person at the ballpark. You might have some luck by the players’ entrance hours before the game or in the front row during BP. The best place is the signing booth where two or three players at a time are required by the club to sign autographs. Obviously, your chances increase if you send a SASE to the player with a polite letter. The better the player, the less likely you are to get an autograph. To increase your chances, ask for autographs from players before they become superstars. Q: If someone wants to get an autograph from two fun authors like yourselves, any tips? Q: Last question: you two want to create a “Blooperstown” exhibit, pursuing some of the memorabilia you’re writing about. How’s the hunt? A: We’re not having much luck because the really good things we want are from an earlier era and are nowhere to be found. Families of deceased players got rid of their things. However, we’re still trying. We’re hoping to get the army helmet that Steve Dahl wore at Disco Demolition Night. We believe the hat Jose Canseco wore when a flyball bounced off his head for a homer is too expensive for us. Allan, as one of those unlucky collectors who isn’t a grade schooler or a beautiful woman, I hope you’ll pen an “Adventures in Autographing” someday. The stories we could tell! Coming Monday: Honoring “Baseball Passings,” one of Facebook’s greatest sites! 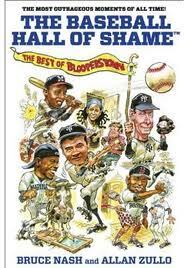 “The Baseball Hall of Shame” Reopens With “The Best of Blooperstown” — Strange, But True FUN! to adorn this cover, too! Major League Baseball can laugh at itself! Authors Bruce Nash and Allan Zullo are back again. (Take that, Simon and Garfunkel!) The pair have revived their “Baseball Hall of Fame” series with a fifth title called The Best of Blooperstown. This offbeat book combines a “best of” format, while adding 40 percent new stories. In tales as recent as 2011, the five newest inductees include Orlando Hudson, Denard Span, John Lindsey, Lastings Milledge and Chris Coughlan. My favorite tales? Nash and Zullo uncover a pair of gems for autograph collectors. Once, Will McEnany substituted his uniformed twin brother in the Pirates bullpen. Not only did he fool skipper Chuck Tanner, the reliever’s kin signed autographs for fans. Talk about a rare variation to collect? Also, readers discover why outfielder Al Smith once signed autographs only for fans who claimed to have the same last name. This book is fun reading for a full nine innings. Each story may run one or two pages. Read it during the commercial breaks for your next televised baseball game viewing. Best of all, the infamous wrong-doers in this book share a laugh with the authors. There’s no denials or finger-pointing over what went wrong on the field. I could imagine the highlighted subjects signing autographs for a collector who wrote them about their diamond misdeeds. The players seem to appreciate the recognition. After all, they won’t be forgotten, as long as Nash and Zullo are the keepers of the game’s hilarious history. I’m glad they’re back and on my bookshelf again. I awoke to find that the Baltimore Orioles had the best record in the American League this morning. Is that good news for pitcher Pat Neshek? The hurler awaits at AAA Norfolk. No O’s fan wants to mess with success. However, I know is that Neshek’s stellar spring training stats prove he deserves to be back in the bigs…somewhere. No matter where he’s at, Neshek remains the hobby’s best friend in baseball. He’s more than a signing machine. He takes pride in being a collector, too. He answered some questions when I wrote him c/o the Tide. Q: Besides the SASE, what tips do you have for collectors by mail? A: Keep it short and simple. Include a SASE and research which players sign TTM. Q: Your website rocks. I’ve enjoyed your great card set reviews. 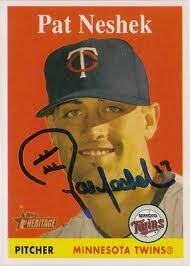 What’s been your favorite Pat Neshek cards so far — and why? A: 2007 Topps Heritage. It’s a tough SP to find. Q: Bless you for your penmanship. What’s kept you from a “P— N—,” the standard abbreviated scribble so many players succumb to? A: I enjoy signing and like a nice signature people can read.